Patients who come into our Chicago practice are often seeking a way to improve the aesthetic quality of their smiles. Problems like chipping, deep discoloration, and uneven teeth can be solved through a number of our available cosmetic services, but one treatment option in particular allows for the comprehensive correction of multiple glaring flaws. With porcelain veneers, patients can conveniently and permanently conceal most types of imperfections. But while the treatment may be permanent, the veneers themselves will most likely need eventual replacement. The specific duration of veneers, as with any restoration, is primarily dependent upon how well patients care for them. With the right dental habits, you can make your results last for many years before requiring a follow-up procedure. Follow these aftercare instructions to truly get the best investment from your porcelain veneers. What Can Affect the Lifespan of Porcelain Veneers? Tooth decay: Cavities are still able to form under a veneer, within the natural tooth tissue. If a cavity does form, the veneer will have to be removed and replaced in order for the cosmetic dentist to properly restore the tooth’s health. Physical injury: The same physical trauma that can damage a regular tooth poses an even greater threat to veneers. Accidents, falls, and collisions can result in large chips or cracks that are not easily reparable. Unnatural pressure: If too much stress is exerted on a veneer or it is bent the wrong way, damage may occur. This is more likely to happen if teeth are used to hold, bite, or manipulate non-consumable objects, such as plastic containers or pens. Teeth grinding: Bruxism is the habit of grinding or clenching one’s teeth, most often while asleep. More severe cases of bruxism can wear away natural tooth enamel as well as porcelain restorations. Discoloration: Porcelain may be highly resistant to stains, but it is still possible for discoloration to occur over time. This chance increases when food particles are left on teeth due to lack of hygiene. It’s important to maintain good hygiene habits in general, but this is especially true for extending the life of porcelain veneers. Because any hint of decay may lead to necessary restorative treatment, patients with veneers must be diligent in keeping their teeth clean and healthy. Also remember that as restorations age, the dental cement between them and underlying tooth tissue may erode slightly, giving way to small crevices for bacteria to hide. Be sure to brush teeth at least twice per day, preferably after meals. Use a soft-bristled toothbrush with fluoride toothpaste, and brush vertically, away from the gum line. 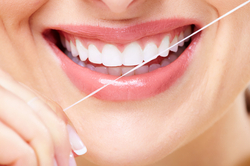 You should also be flossing daily, as a toothbrush cannot be expected to reach between teeth – one of the most common areas of decay. Between brushings, drink plenty of water with meals. Water will help neutralize acid from food, disperse bacterial build-up, and clean food particles from teeth. To avoid breaking your veneers, consider which activities or habits may risk their safety. First, do not use your teeth as tools, such as to open or turn objects. Chewing on fingernails or other items should be similarly avoided. Even without veneers, this can result in chipped and worn teeth. Even accidents can be largely avoided through proper forethought and precaution. If you are engaged in contact sports or other physical activities that have a chance of sudden impact, consider the use of a mouth guard. With a customized mouth guard at our dental office, you can protect your teeth and veneers more fully and comfortably than with store-bought products. If you suffer from bruxism while you sleep, chances are your teeth will suffer too. Habitual teeth grinding tends to result in tooth erosion and chipping, affecting both the health and appearance of a smile. Mild bruxism may shorten the lifespan of veneers over time, while more severe cases can cause large chips to form in a single night. To treat this condition, you can be fitted for a special occlusal splint to wear while you sleep, called a night guard. A night guard will protect your teeth from each other and lessen the overall effects of bruxism. Just as it’s important to schedule regular exams for your teeth, a professional exam is also necessary to keep track of old restorations. After cleaning your teeth, Dr. Emery will check for signs of decay and disease that may threaten your smile. In addition, the condition of your veneers can be evaluated, and specific suggestions may be given for preserving them. Contact our office to schedule your next visit with us.